Turkmenistan's President, Gurbanguly Berdimuhamedov, has narrowly escaped serious injury after riding a horse to victory in a national racing event. Soon after the president crossed the finish line his horse fell, throwing him in front of other galloping horses which only just missed him. Officials who rushed to aid him were left with a public-relations nightmare. The accident was a major embarrassment to aides more used to presenting their leader in the best possible light. The president wields almost absolute power in the secretive Central Asian country, where dissent is not tolerated and free speech is non-existent. State media regularly extol his leadership, cultivating the image of a man with many and varied talents. He has at various times been shown winning a national car race, performing surgery, and playing his own composition on a guitar in front of a huge audience. The president - a former dentist - has also written books on horses and medicine which are best sellers in Turkmenistan, an isolated desert nation with a poor human rights record but rich in natural gas reserves. The riding event on Sunday was meant to celebrate the horsemanship of Turkmenistan's strongman ruler. It marked the climax of a three-day annual holiday celebrating the national Akhal Teke horse breed, which is revered in Turkmenistan. A BBC correspondent says that it only became clear just before the race that the president would be taking part. The announcement - made in the Turkmen language only - was greeted with a huge cheer by a crowd several thousand strong which seemed genuinely to wish their leader well, our correspondent adds. But just after President Berdimuhamedov crossed the finish-line, his horse fell directly in front of dozens of journalists invited to cover the event. He was flung forward, landing heavily on the ground as other horses sped by. The course commentator was lost for words as the president lay still for several seconds before dozens of black-suited security guards rushed over to attend to him. An ambulance eventually took him away. Our correspondent says that there was a shocked silence in the stadium for about 30 minutes and no public announcements were made. Some spectators began to cry in expectation of bad news. Foreign reporters trying to confirm that it really was the president who had taken a fall were asked by their minders not to make telephone calls, record video footage or report what was happening. After about 40 minutes the president reappeared in traditional Turkmen dress to a large round of applause. He calmly waved at the crowd, apparently unharmed, and the event resumed as if nothing had happened. Journalists were then assembled by officials and asked politely to erase all pictures and footage taken of the incident, which was described as a "sporting accident" of no interest to people at home or abroad. But footage of the accident was nevertheless taken out of the stadium. 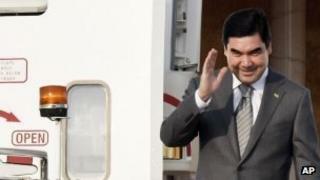 Mr Berdimuhamedov - who is known under the honorary title of Arkadag, Turkmen for "the protector" - has built an elaborate personality cult ever since assuming power in 2006 following the death of his predecessor Saparmurat Niyazov, who himself had a reputation for his eccentric leadership style. The Dictator: Why do autocrats do strange things? Has Turkmenistan changed at all?